Fulmars nesting in cliffs , near Elegug Stacks. While the Fulmar may look like a gull, it drinks salt water and is a true Procellariidae. Gulls must come to land to drink fresh water. 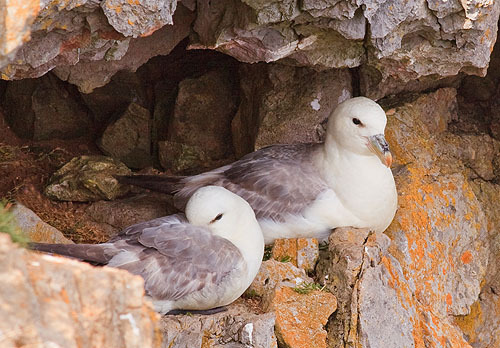 Fulmars use the tubelike nostrils on top of the bill to excrete excess salt from their bodies . Like all petrels and shearwaters they are marine birds which spend their lives on the open ocean except when breeding . A tube nosed Petrel / hooked bill / Breeding resident / This grey and white seabird is related to the albatrosses . It flies low over the sea on stiff wings, with shallow wingbeats, gliding and banking to show its white underparts then grey upperparts / At its breeding sites it will fly high up the cliff face, riding the updraughts / Fulmars make guttural growls , chuckles and grunts at there breeding sites / They defend their nests from intruders by spitting out a foul-smelling oil / Present at the breeding sites nearly all year / Nests on a Cliff or Earth ledge 1 Brood , 1 egg , April - June , Incubation 52 days , Fledge 48 days .